The Public Works Department oversees town-maintained streets. For a list of streets not maintained by the town, see the state-maintained streets section below. Report potholes and other damage to town-maintained streets by placing a work order by email, or by calling 919-296-9600. Please provide the specific location of the problem, such as the nearest street address or intersection. Call 911 to report conditions that pose an immediate threat to safety. All questions and concerns about these streets (including pavement, curb, and gutter repairs; signs; and snow removal) should be directed to the N.C. Department of Transportation at 919-732-4330. 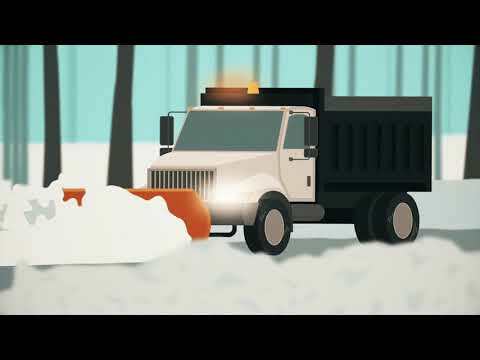 Plowing begins when snowfall reaches a depth of 2 inches on the pavement. For snowfall of 2 to 4 inches, employees plow all town streets, giving first priority to the town's bridges, emergency services and the county refueling station within town limits. For snowfall above 4 inches, employees concentrate all efforts on keeping the bridges, emergency services and the county refueling station clear until conditions allow them to plow the remaining streets within the town limits. The town's main thoroughfares are state roads and are maintained by the state. The town is not responsible for clearing driveways after plowing. Traffic signals are not maintained by the town. For problems with traffic signals, contact the N.C. Department of Transportation online or at 877-368-4968. Streetlights in need of maintenance should be reported to the service company. An address or pole number for the streetlight should be obtained. If the streetlight is within the Duke Energy service area, notify the company by calling 800-777-9898 or by completing an outdoor lighting repair request form on the company's website. If the streetlight is located within the Piedmont Electric Membership Corporation service area, notify the company by calling 919-732-2123 or by completing a contact form on the company's website. The affected pole will need to be marked with a ribbon. Street and traffic signs are installed and maintained by the Streets Division. Posters or other signage may not be placed on any sign or post. Report problems by placing a work order by email, or by calling 919-296-9600. The town sweeps curb and gutter streets on the last Friday of each month. Street sweeping in residential areas begins at 7 a.m. and is usually completed by noon. Non-residential areas are swept earlier. Maintain a safe distance from the street-sweeping truck during operation. Do not park vehicles on curb and gutter streets the last Friday morning of each month. Do not place brush, leaves or other vegetation on streets with curbing. Report a blocked storm drain or broken or dislocated drain cover by placing a work order by email, or by calling 919-296-9600. Please provide the specific location of the problem, such as the nearest street address or intersection. Call 911 to report conditions that pose an immediate threat to safety. Illegal dumping into storm drains should be reported to the Stormwater and Environmental Services Division. The town maintains drainage areas on town-maintained property, rights-of-way and easements to ensure they remain free of growth and other obstructions that restrict water flow. Grass is mowed periodically, and trees are cleared to prevent roots from penetrating sewer lines. Erosion may require the town to install riprap, grass seed and straw or other erosion-control devices. Before work is done on an easement, a letter is sent to the property owner explaining the purpose and approximate duration of the work to be performed. The advance notice gives property owners an opportunity to ask questions and remove personal items prior to clearing. During clearing, a town employee is on site at all times to monitor progress and address citizen concerns. Request maintenance by placing a work order by email, or by calling 919-296-9600. Public Works employees remove dead animals from town- and state-maintained roads within the town limits. The town does not remove animals from private property. Report a dead animal by placing a work order by email, or by calling 919-296-9600. Call 911 to report conditions that pose an immediate threat to safety.